Last nite I completed the installation of Box Van's raised subfloor. The subfloor is now solid as a rock! 1. The frame for the subfloor is made from 3/4 x 3 common board. 2. 3M VHB RP25 Tape was used to secure the frame to Box Van's aluminum deck. 3. To prepare for the 3M VHB tape, the aluminum deck and the frame board were cleaned with isopropyl alcohol. The frame was positioned on 16" centers. 4. The top of the subfloor frame was cleaned with isopropyl alcohol and 3M VHB tape was applied to the frame. 5. 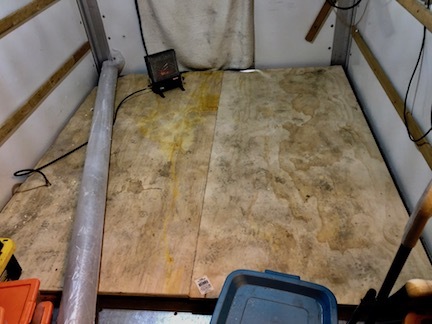 The areas where the 3/4" plywood and the frame make contact was cleaned with isopropyl alcohol. 6. The plywood subfloor was carefully positioned over the frame and then dropped on to the frame. After the plywood subfloor was secured to the frame, I noticed that all four corner areas of the plywood subfloor were not down tight against the frame. Apparently, the plywood was not flat at the corners. In order to get the plywood to be in contact with the 3M VHB tape on the frame, I used deck screws. The deck screws worked! the roll of Armstrong vinyl. Note: The subfloor is very dirty because of me tracking in with muddy shoes. Before the vinyl is laid, I will clean off the subfloor. After installing your vinyl, you might want to tape some cardboard boxes over it for protection as you work. The tape will keep them from sliding and you can remove portions of it as need to install your cabinets. Accidents can and do happen, plus dirt will not be ground into your pretty vinyl flooring. Hi George. Just curious. What is the interior width of the box van at this point? The interior width of Box Van from wall to wall is 93". U-Haul provided wood tie-down rails for their customers to secure their furniture. A tie-down rail extends 1-1/4" from the wall. And there are tie down rails on every wall. My living quarters wall frames are 2.5" thick. I plan to use 1/4" plywood for my wall covering. So, that takes away an additional 1/2" for the two opposite walls. So 7’ wide. How long is your space from the front wall to wherever you put the back wall? And the rest is your workshop. The front-to-back dimension for my living quarters is 100". The workshop is 68" front-to-back. Something that I have not Blogged about much is the overhead space [Grandma's Attic]. That overhead space is going to be part of my living quarters. My fresh water tank has been up there for several weeks. Yesterday, I placed my hot water heater there. I will use that space as a large kitchen cabinet.